In some cases, a very belated thank you to everyone who over the last 12 months or so have passed on logbooks. I have finally loaded up ten to the logbook section, though I am aware there are some more still to process and add, which will happen as soon as I can manage to do it. Ten extra books to the collection is a significant addition and now brings this online collection to a total of 45 logbooks, with examples representing Operational careers in all years of the War. 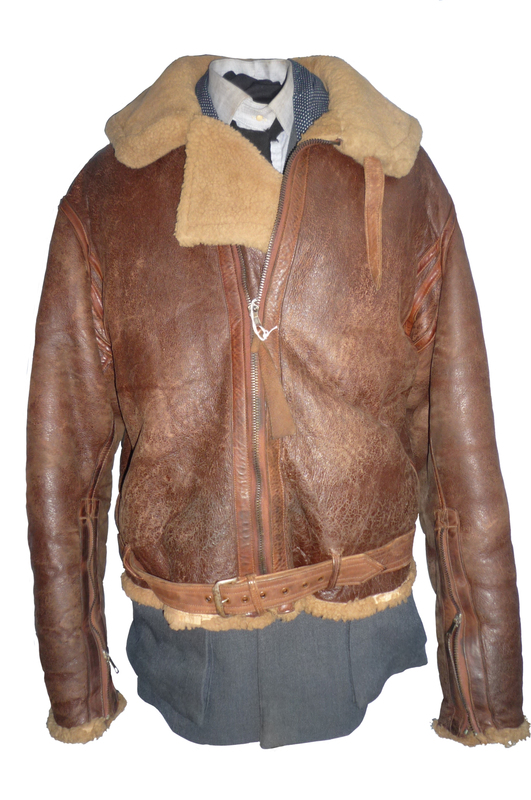 In itself, this must represent one of the largest online collections of this kind, for a Bomber Command Squadron. This new collection in itself represents a spread of trades and periods and in itself, again spreads across all years of the War. 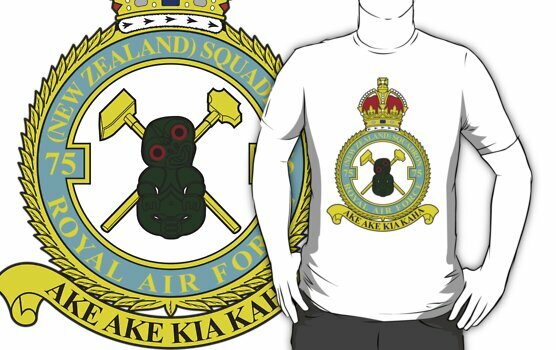 A highly detailed logbook describing Franks entire flying career, through training and 2 tours with 75(NZ) Squadron RAF. Frank Andrews returned to the Squadron for his second tour as Squadron Leader. Flying 9 Ops with the Squadron, Eric’s logbook is interesting as it shows omissions regarding a number of Ops in the Official Form 540 for the Squadron. 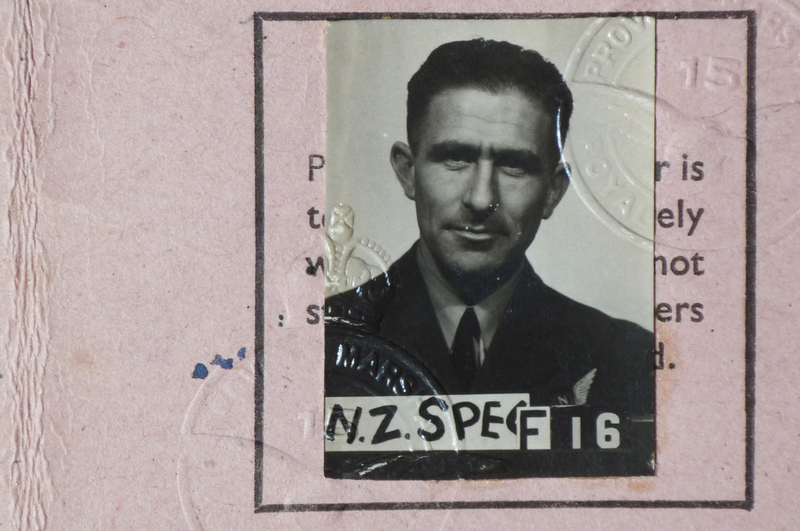 Mick joined 75(NZ) Squadron in June 1941 flying with Sgt Francis Fox and Hone Roberts. After a refresher course at No. 3 G.T.F. he returned to Hone Robert’s crew. On the 12th of August 1941, after being attacked by an ME110, the crew baled out leaving P/O Roberts at the controls – eventually successfully landing the damaged aircraft. Mick then crewed with John Sandys , flying occasional Ops with Reginald Sawrey-Cookson’s crew. At the end of March 1942, Mick transferred ro No.11 O.T.U at Bassingbourne. Flying out of Newmarket and then Mepal, the Thomas crew were lost on the 31st of July 1943 while attacking Remscheid. Only Hector and the crew’s Wireless Operator survived. 30 Ops with John Perfrement, including the infamous July 21st Op to Homberg, when the Squadron lost 5 aircraft. The crew also flew on the 6th of June in support of the D-Day landings. Arriving with the Squadron on the 27th of August 1944, Reg completed 34 Ops with the Ford crew, including 2 to the infamous target of Homberg. Despite completing his Operational Tour, he stayed with the Squadron, instructing in Navigation, completing training flights, right up to the Squadrons disbandment after its move to Spilsby after the end of hostilities in Europe. 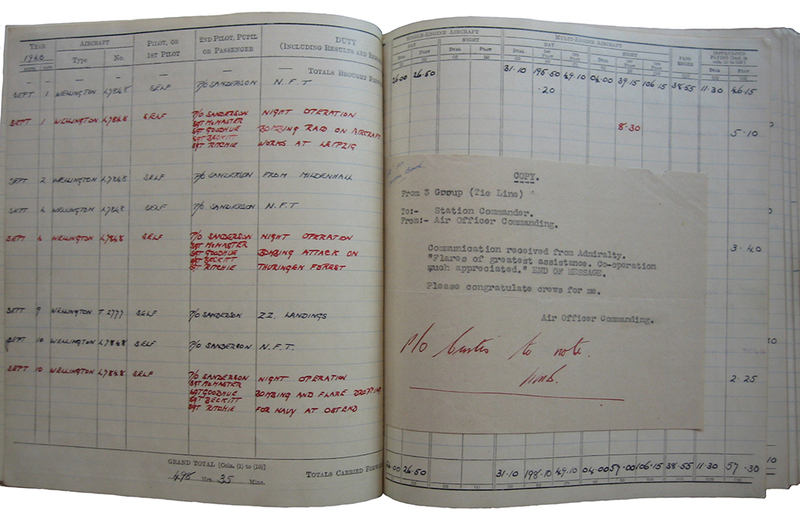 Completing a total of 29 Ops, through the second half of 1944, Laurence Bergman’s logbook contains detailed Op notes which are of great interest. Flying on their final Op of 30, the Parsons crew were hit by heavy flak whilst over target at Heinrich-Hutte. 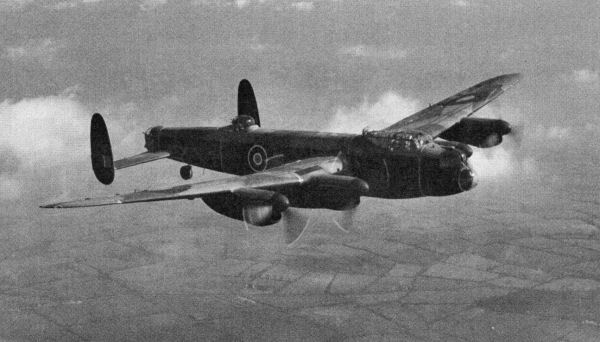 Their Lancaster, PB741 AA-E suffered catastrophic damage to the port side engines, the wing being seen to break off as the aircraft disappeared under the clouds. John Lawrence Beard was aged 19. 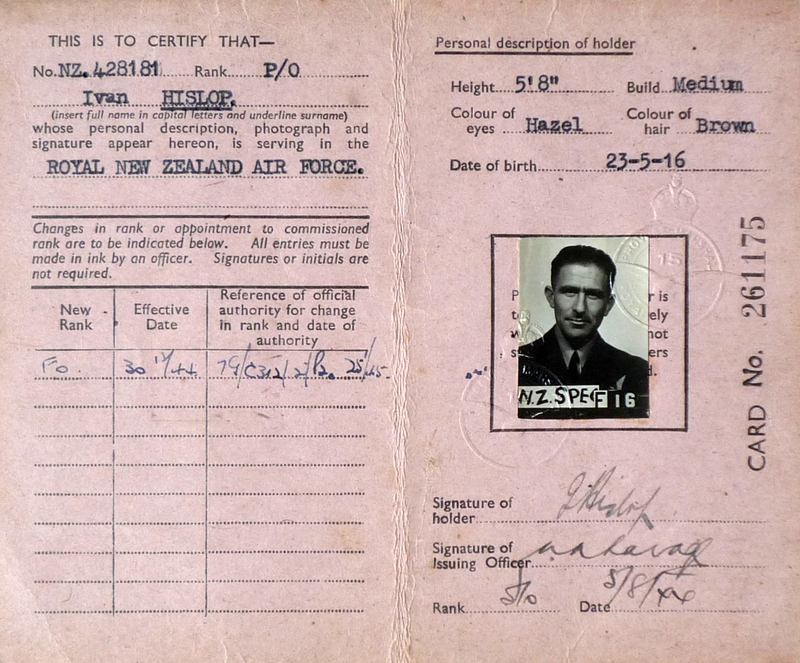 Sidney George Frederick Sizeland, Rear Gunner – January to July 1945 (Wallace Bassett, Laurence Mckenna crew). 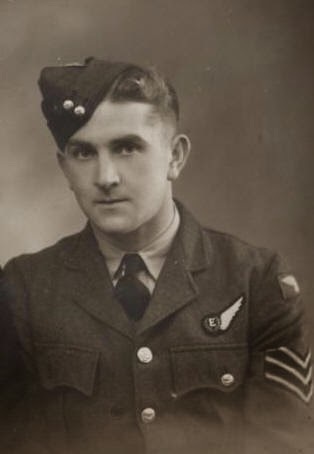 Having flown 2 Ops with 149 and 4 Ops with 218 Squadron, Sid flew 4 Ops with Wallace Bassett, before flying the rest of his tour with Laurence McKenna, being involved in main War Ops, Gardening, Operation Manna, Prisoner Repatriation and Baedecker. 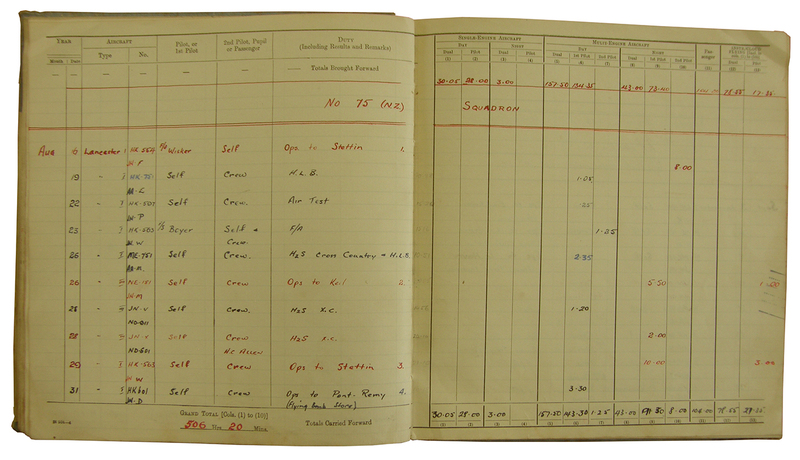 Whilst short in duration, the latest logbook currently held, detailing sorties flown after the Squadron had moved to Spilsby as part of Tiger Force. This entry was posted in general and tagged 1940, 1941, 1942, 1943, 1944, 1945, 75(NZ) Squadron RAF, Aviation, Bomber Command, book, Douglas Hugh Trigg, Eric Reginald Jones, Feltwell, Frank Albert Andrews, Fred Charles Entwistle Potter, Hector Alistair Stewart, John Lawrence Beard, Laurence Percy Bergman, log, logbook, Mepal, Mildenhall, Newmarket, Reginald Charles Weeden, Sidney George Frederick Sizeland, Verdun Cecil 'Mick' Strickland on March 21, 2016 by 75nzsquadron. Many thanks indeed to Kerry for passing on these images of his collection of dress and flying uniforms of Richard Melville Curtis. 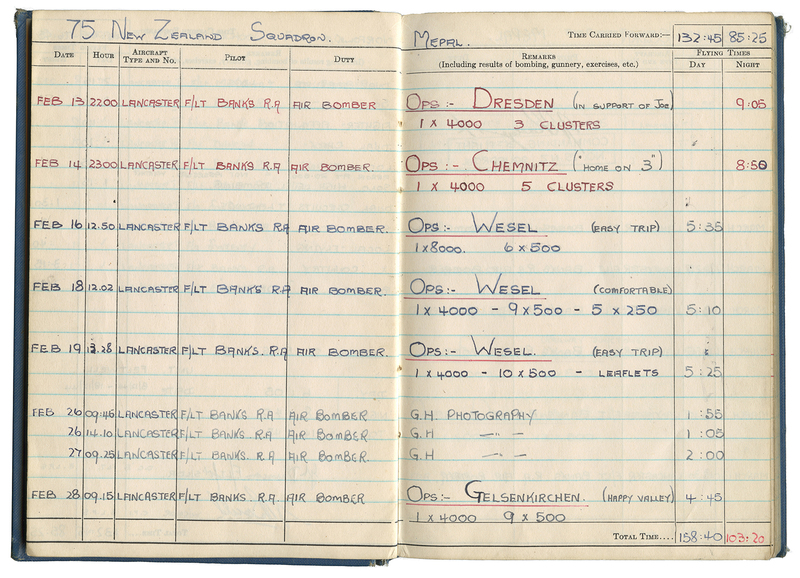 Kerry was kind enough to pass on a copy of Richard’s logbook a month ago and you can see it here. This represents an astonishingly diverse and well preserved collection of period clothing. the full set of images can be seen here, in the ‘collections’ section. This entry was posted in general and tagged 1939, 75(NZ) Squadron RAF, Frederick John 'Popeye' Lucas, James Norman Ritchie, Leonard Gould, logbook, Rex Martyn Sanderson, Richard Melville Curtis, Sgt. Beckitt, Sgt. McMaster, Trevor James Goodhue on November 24, 2013 by 75nzsquadron. 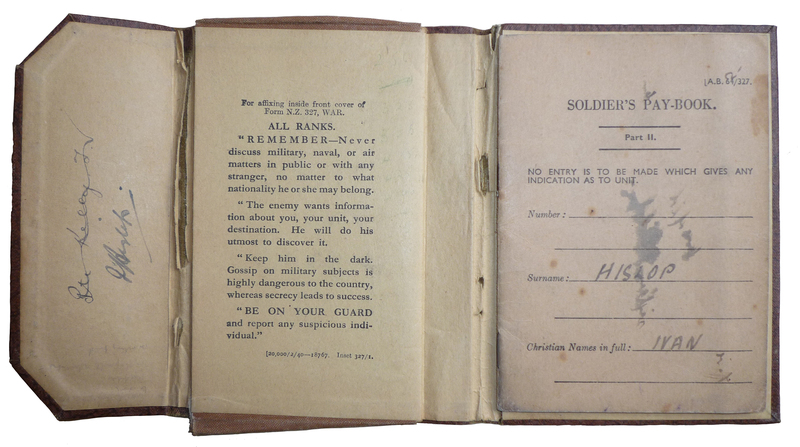 Many thanks to Kerry for donating the logbook of Richard Melville Curtis to the blog, from his collection. 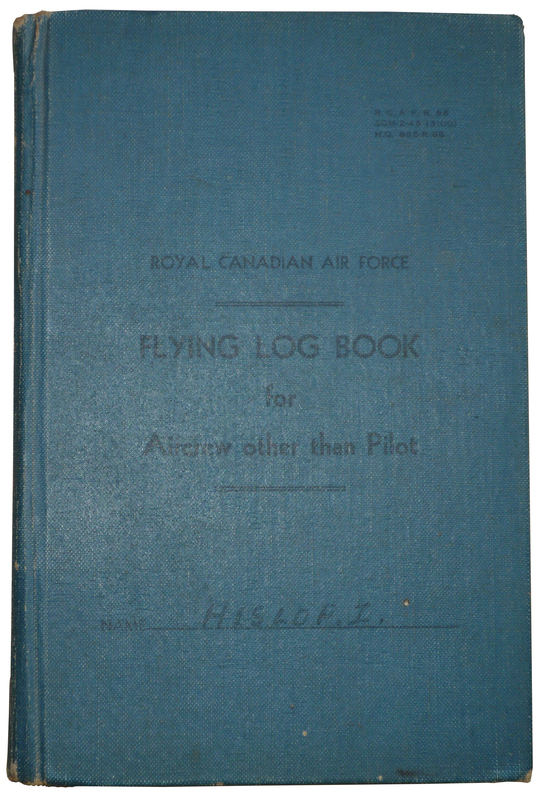 By Kerry’s own observation, this represents the earliest logbook in the collection for the Squadron. There is also a connection from a previous post about Leonard Gould and his Pilot Frederick John ‘Popeye’ Lucas – Richard flew as 2nd Pilot with their crew before taking his own crew into combat. Fascinatingly, the event described in the citation is also recorded in the logbook, with a copy of the note of thanks sent to the Squadron from the Admiralty. Read through Richard’s logbook here. 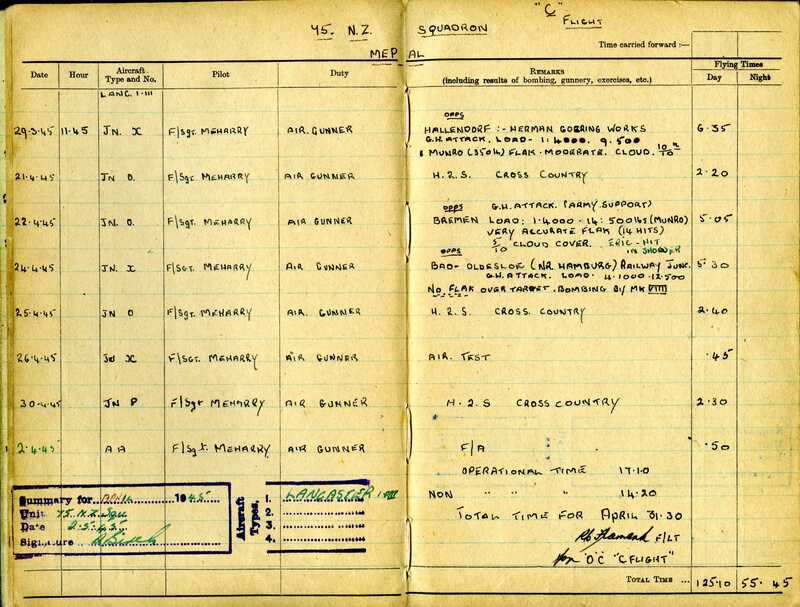 This entry was posted in general and tagged 1939, 75(NZ) Squadron RAF, Frederick John 'Popeye' Lucas, James Norman Ritchie, Leonard Gould, logbook, Rex Martyn Sanderson, Richard Melville Curtis, Sgt. Beckitt, Sgt. McMaster, Trevor James Goodhue on October 21, 2013 by 75nzsquadron. Its with great pleasure and a slight apology that I finally add the log book of Leo McCartin to the site. Early in my research I began talking to Paul and Jim about their relatives who were both lost in ND911 on the 20th November 1944 on a raid to Homberg. I would like to thank Paul and his wife, who is Leo’s niece for this kind donation to the collection. Leo’s logbook is held in the Australian War Memorial and Paul had to photograph what is physically a very large logbook in perhaps was not the most ideal photographic conditions. Nevertheless, I have now managed to clean them up. This entry was posted in general and tagged 1944, 20th November 1944, 75(NZ) Squadron RAF, Homberg, John Gray, John Miles, Leonard Martin, logbook, Mepal, Patrick Leo McCartin, Phillip Smith, William Warlow on February 25, 2013 by 75nzsquadron. As the first offering from the documentation that Martyn has so generously recently donated to me, the logbook of Sgt. Reuben William Birch, Rear Gunner with the Meharry crew. As with my fathers logbook, I will place the other documents Martyn has passed on to me in a jump off menu off of his logbook page, through next week. 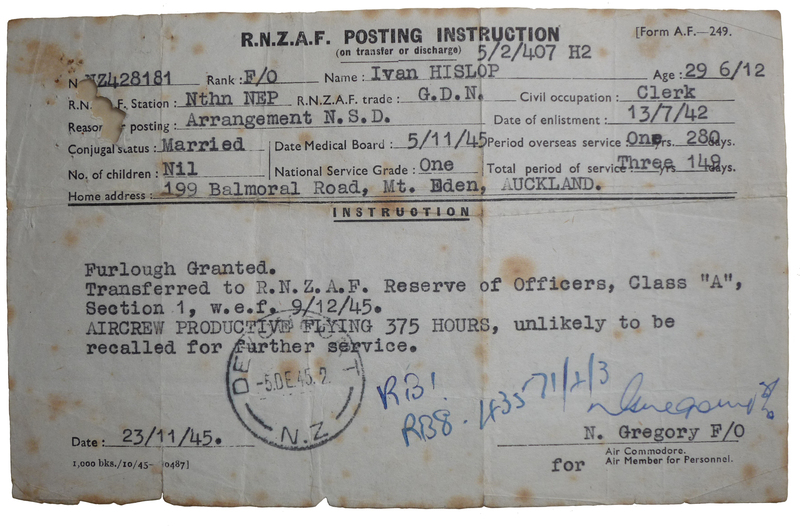 This entry was posted in general and tagged 1945, 75(NZ) Squadron RAF, Lancaster, logbook, Meharry crew, Mepal, Rear Gunner, Reuben William Birch on January 25, 2013 by 75nzsquadron.